No previous restaurant or franchise experience is required to open your first Papa Murphy's store. From helping you select your site and open your store to offering you a comprehensive five-phase training program and providing marketing materials created with your success in mind, our corporate staff supports franchise owners from day one. Our fresh Take 'N' Bake pizza concept comes with more than just quality toppings for all tastes. Limited hours of operation, smaller store footprints and other proven efficiencies make a Papa Murphy's franchise a manageable investment of both your time and money. Personal and professional success can come in many delicious varieties. But you've not made it until you've made a fresh Papa Murphy's® pizza. Our franchise owner/operators—entrepreneurs just like you—have made us the world's largest, fastest growing Take 'N' Bake pizza franchise and America's best pizza chain five years in a row.∗ So if you're interested in joining a franchise family that's really going places, Papa Murphy's is the opportunity for you. Customer loyalty is a given when you consistently provide a quality product at a reasonable price. So it's no wonder that consumers have voted Papa Murphy's America's best pizza chain five years in a row.∗ Bringing home and baking a fresh Papa Murphy's pizza is guaranteed to please the entire family. Because Papa Murphy's stores do not require ovens or full kitchens, dining room seating and other expensive equipment, your initial construction costs and operating expenses are less than they would be with a quick service restaurant and other comparable franchises. Papa Murphy's is more than 1,000 locations strong—and currently extending our franchise family in Arizona, Arkansas, California, Colorado, Kentucky, Michigan, Missouri, Nevada, Ohio, Oklahoma and Texas. To learn more about bringing a Papa Murphy's location to a community in one of these states, complete the form below. 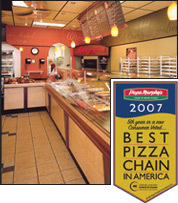 ©2007 Papa Murphy's International, Inc. All Rights Reserved. This is not an offer to purchase a franchise. Offerings are made by Uniform Franchise Offering Circular only. Please note this franchise is currently not accepting inquiries from outside the United States. Interested parties should have at least $80,000 to invest. Click on Request Information for FREE info on how to open a Papa Murphys Pizza franchise today! Please Note: This Papa Murphy's Pizza franchise opportunity and other franchise business opportunities, businesses and franchises for sale on this web site are not to be considered as an "offering", "franchise offering", suggestion or recommendation by Franchise Leader™. This advertisement depends entirely on the truthfulness of the information provided by our advertisers which includes, but is not limited to, franchisers, franchise brokers, franchise consultants and business brokers. Franchise Leader™ recommends that you consult a lawyer, financial consultant, accountant or professional advisor before buying a franchise or business opportunity or any type of business. By using this form or any part of our website, you have agreed to all terms and conditions of Franchise Leader™. Please review our Terms & Conditions for more information.